Last week, I headed back to New York City for the third time since returning home from my trip around the world. After settling into my brother's apartment in the East Village, I looked to Yelp for a good local Thai restaurant to meet my friend for dinner. Zabb City at 244 East 13th Street had 4 starts which worked for me. I'm just now getting into Yelp, but I still don't have the patience to read through the reviews. It was a really small restaurant, maybe 6-7 tables. I ordered a Beerlao, the curry puffs for an appetizer, and the spicy panang curry with chicken as my main. I can't recall what was in the curry puffs, however they were very tasty. 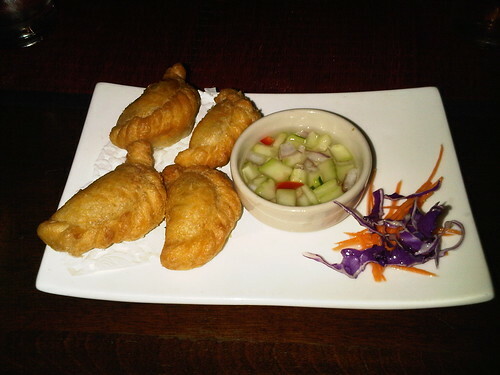 They look like empanadas from the outside, but once dipped in the sauce, they were decidedly Asian in flavor. 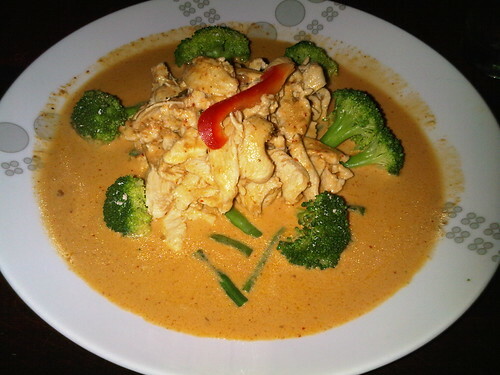 The main event was my favorite dish from Thailand – panang curry with chicken and jasmine rice. I ordered the dish medium spicy, and that's exactly what I got. My mouth was on fire and I couldn't get enough of the peanut-flavored curry. Aside from the broccoli, which as usual, was pushed to the site, I devoured the entire dish, ensuring no grain of curry-soaked rice was left behind.